A little round up of my joys in April! 1. Picking daffodils from the garden. My mum planted some in the garden last year and they have just started to bloom! 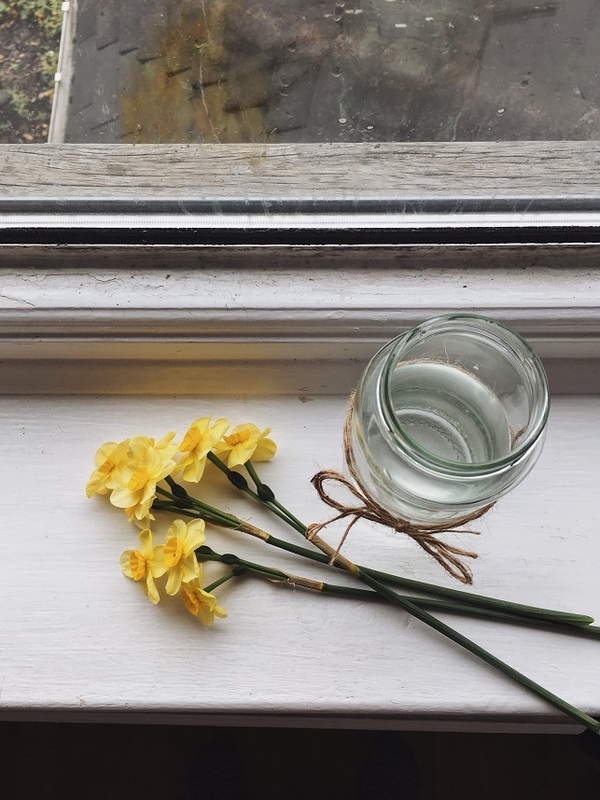 They have such a lovely fresh scent so I picked a few and popped them in a jar of water to place on my windowsill. 2. Seeing all the baby lambs in the fields on my way to work. They are just so adorable, bouncing around the fields! It's such a lovely sight to see. 3. Having my hair cut shorter. I had my hair cut two months back but I just didn't feel like I had enough taken off, so I went back this month and decided to go much shorter for a spring/summer refresh. I'm also looking forward to getting my hair colour refreshed next month too! 4. Spending quiet evenings in after a long day. I love to switch on the fairy lights and catch up on some Netflix or YouTube. I've also been loving listening to some podcast episodes in the evenings which I find so relaxing. 5. Seeing new leaves appearing on my apple tree. Last year I decided I wanted to have a go at growing a pink lady apple tree from seed, my first two attempts failed but this one seems to be doing really well! 6. Spotting more cherry blossom and magnolia trees around the village. 7. Enjoying homemade fruit scones with clotted cream, jam and a cup of tea. Yum! 8. Watching Star Wars: The Last Jedi on the Sky Store. 9. Sunshine and warmer temperatures. I wasn't expecting a heatwave in April, especially after all that rain we had! However the rain has been back again this week but I'm hoping it won't stay around for too long! 10. Adding some new spring pieces to my wardrobe. I've been loving wearing striped t-shirts with an oversized knit cardigan, jeans and converse which is my current go to casual spring outfit! What have been your joys in April?